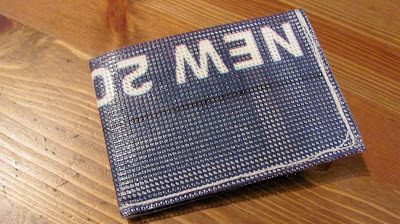 The other night the sorry excuse for a wallet I was using started to rip. 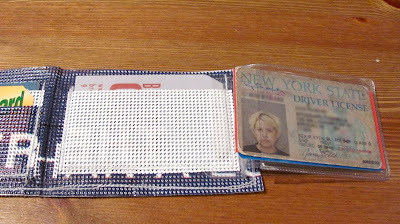 )It was the little plastic sleeve my gym card goes into) I thought I would make a simple replacement using my mesh billboard material. Wallets i find are always too extreme for me or there is zippers or buttons or something getting in the way of me putting it in my pocket of opening it. So I made one that fits just me! 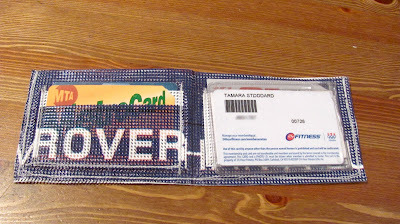 And I sewed my gym card into the side so my card and ID flip out when I need it to. Genius! 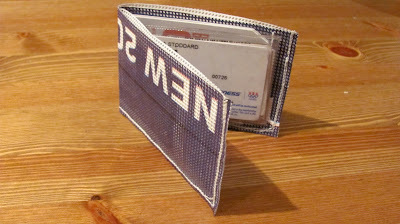 I will be making some more wallets for renegade. I like this one way better than the old one!